Candle magic is one of the simplest forms of spellcasting, and as such, it doesn’t require a lot of fancy ritual or ceremonial tools. In other words, anyone with a candle can cast a spell. Think back to when you made a wish before you blew out the candles on your birthday cake. The same idea applies to candle magic, only instead of just hoping for your wish to come true, you're declaring your intent. Most practitioners of magical systems will tell you that the size of your candle really isn't important. In fact, really big candles may be counterproductive. For instance, a candle that takes three days to burn can be highly distracting to someone working a spell that depends on the candle burning all the way down. Typically, a short taper candle or a votive candle will work best. In some cases, a spell might call for a specific type of candle, such as a seven-day candle or a figure candle to represent a particular person, a form of sympathetic magic. One of the most popular candles, believe it or not, is the little menorah candle sold by the box in the kosher section of the grocery store. They're about four inches long, white, unscented, and thin. Because of this, they're perfect for spell work. You should always use a brand new candle for spell work and not candles that you burned at, say, the dinner table or in the bathroom the day before. According to some magical traditions, a candle picks up vibrations from the items around it once it starts to burn. If a used candle is already tainted by vibrations, some people believe it will lead to a negative or ineffective magical outcome. After you've selected a candle, oil or dress it before burning. This is a method by which you'll establish a psychic link between you and the candle itself. In other words, you're charging the candle with your own energy and personal vibrations and projecting your intent into the wax before you burn it. To dress a candle, you'll need a natural oil; many practitioners like to use grapeseed because it has no smell. Another option is to use special candle magic oils from one of the metaphysical supply stores. Begin at the top of the candle, and rub the oil down to the middle. Then, begin at the base of the candle and rub the oil up towards the middle, ending where the first coating of oil left off. In some traditions, the anointing is done just the opposite way; start in the middle and work your way towards the two ends. If your working calls for herbs to be used as well, roll the oiled candle in the powdered herbs until it is coated all the way around. It's important to remember, however, that a candle is just a tool. It is not inherently magical but a way to create magic using the element of fire to set one's intention into motion. Just as other tools used with magical intent are, candles should be spiritually cleansed before they're included in a spell. The most basic form of candle magic uses a piece of colored paper that matches the intent of your candle. Decide what your goal is, and write it on the piece of paper. If you're going to do a money working, you would write down your intent: "I will become financially prosperous." In some traditions, you would jot down your goal in a magical alphabet, such as Theban or Enochian. Because this is a money-oriented working, we would select either a gold or green piece of paper and a candle of the same color. As you write down your goal, visualize yourself achieving that goal. Think about the different ways in which your goal might manifest, such as getting a raise at work. Perhaps someone who owed you money will arrive out of the blue to repay their debt. Or maybe you'll get a large tax refund check! Place one corner of the folded paper into the candle's flame and allow it to catch fire. Hold the paper as long as possible (without burning your fingers) and then place it in a fire-safe bowl or cauldron to burn the rest of the way on its own. Allow the candle to burn out completely. When the candle has melted, dispose of it, rather than saving it to use again for another working. Usually, there's not much left of a candle except a stub of wax, and you can either bury it outdoors or dispose of it in whatever manner you choose. In some magical traditions, candles are used for divinatory purposes. 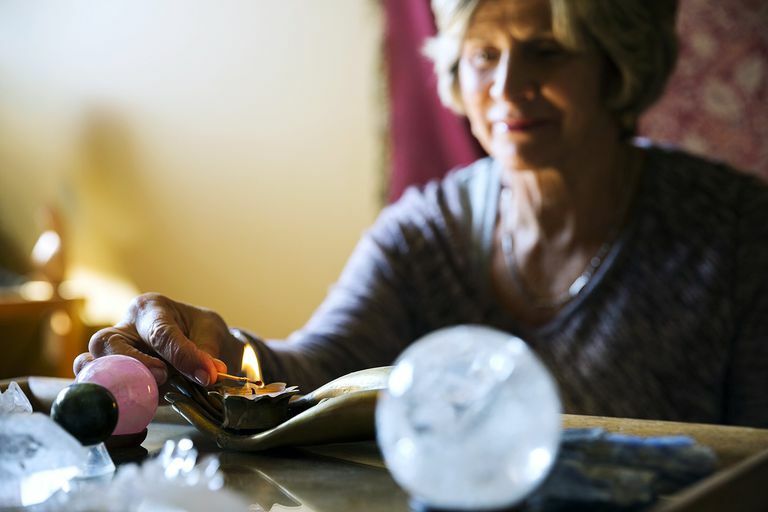 The two most commonly used methods of candle divination are reading the wax and the way that the candle actually burns. To divine by the way the candle burns, you'll have to pay attention to whether the candle burns low or tall, if it flickers, or if there's more than one flame. Two flames could mean someone from the spirit world is helping you reach your goal. Even the colors found in the flame may give you a hint about the effectiveness of your spell. But there's no consensus about what these signs mean. While some practitioners believe a candle that burns tall and strong signals that one's wish will be fulfilled, others point out that the length and quality of the wick can influence how the candle burns, as can an air vent. Focus more on your intent than on how the candle burns. On the other hand, if you want to divine by reading the candle wax, you'll need to drop the melted wax into a bowl of cold water. The wax will harden almost immediately and form shapes. Use these shapes to get the answers to your questions, much as you would if you were reading tea leaves.